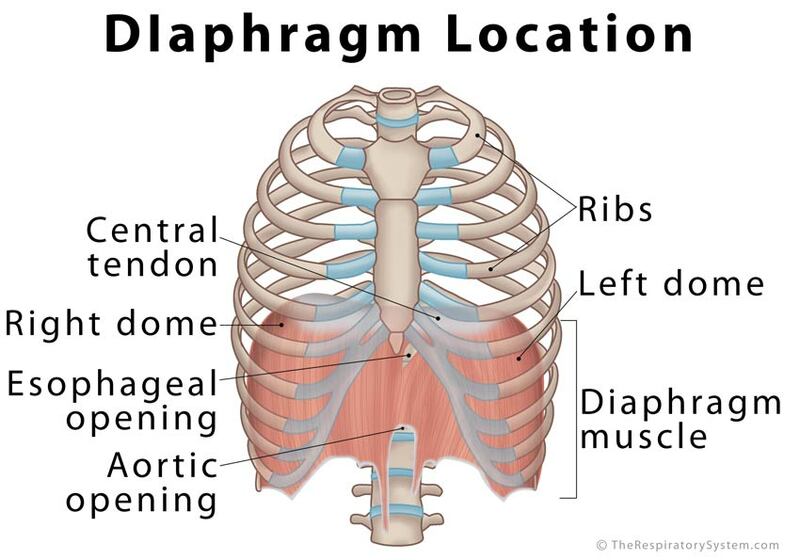 The thoracic diaphragm is a large, flat muscle that plays a vital role in the respiratory system, and is located just beneath the two lungs, dividing the chest cavity from the abdominal cavity . With its characteristic dome shape, it is the primary respiratory muscle, also supporting the lungs and heart . It is a skeletal muscle , and like many other important muscles, the diaphragm is an organ, one of the most important respiratory organs that humans cannot live without . 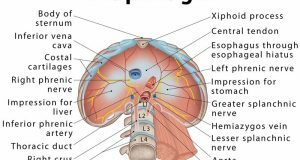 The diaphragm is located between the thoracic and abdominal cavities , with important organs like the lungs and heart located superior to it, and the liver (proximal position), kidney and stomach being inferior to it. The curved muscle is inserted into the lower part of the rib cage. There are three parts of the peripheral muscle, sternal, costal, and lumbar, depending on the location of the peripheral attachment. Sternal part: Originates from the xiphoid process (extending from the sternum) as two thick, fleshy bands that can be referred to as the left and right strips . Lumbar part (Crura): Originates as two tendinous bands from the lumbar vertebrae and the arcuate ligaments (medial and lateral) [3, 5]. These are known as the left and right crura  (singular: crus) depending on the point of their origin. Right Crus: Broader and longer than the left one , it arises from the anterior surfaces of the first, second and third lumbar vertebrae . Left Crus: Arises from the first and second lumbar vertebrae only . An aponeurosis, (interlacing white, fibrous tissues with a wide area of attachment, taking the place of tendons in flat muscles), the central tendon forms the central upper surface of the diaphragm . It fuses with the pericardium (the outer membrane of the heart) located just above it and helps the heart to stay in place . The radial muscle fibers forming the peripheral muscle all converge and connect to the central tendon . Caval opening (vena caval hiatus) at the 8th vertebral level: Allows the inferior vena cava  and the right phrenic nerve branches  to pass through. Esophageal opening (esophageal hiatus) at the 10th vertebra level: Transmits the esophagus, vagus nerves, and the small esophageal arteries . Aortic opening (aortic hiatus) at the 12th vertebral level: Transmits the aorta, azygos, and hemiazygos veins , as well as the thoracic duct . There are a few minor openings or apertures as well, including one on each of the two crura, one transmitting the greater splanchnic nerve, while the other lets the lesser splanchnic nerve pass through. Additionally, there are some small openings in the central tendon for certain veins . The phrenic nerve, originating at the C3-C5 vertebral level, provides motor supply to the diaphragm , and controls its movement . The medullary inspiratory neuron (responsible for regulating breathing) sends information to the diaphragm via this nerve, enabling us to breathe in. The left side of the diaphragm is innervated by the left phrenic nerve and the right side by the right phrenic nerve . Due to this reason, the two halves are capable of working independently . Both the phrenic nerves provide innervation to the right crus . The outer or peripheral regions of the diaphragm are innervated by the lower 6 to 7 intercostal nerves [7, 16]. Its central part gets arterial supply from the phrenic arteries , while the 5 lower intercostal and subcostal arteries provide arterial supply to the costal margins. All these blood vessels connect and open into each other (anastomose) to ensure proper blood supply to the diaphragm . All the arteries are followed by their corresponding veins, with the phrenic veins taking care of the primary drainage of the dome-shaped respiratory muscle. The right phrenic vein drains into the inferior vena cava, and the left phrenic vein empties into the left renal vein, suprarenal vein, or inferior vena cava . Despite being a skeletal muscle, the diaphragm is unique as it can work both as a voluntary and involuntary muscle . Humans do have some control over it, as we can increase or decrease the rate of inhalation, or hold our breath . However, it functions on its own most of the time. Forming the floor of the chest cavity, the main function of the diaphragm is to control its volume by means of contracting and relaxing . When the diaphragm contracts and flattens towards the abdominal cavity, dragging the pleura (the serous membrane around the lungs) with it, this reduces the air pressure within the lungs (including in each of the alveoli) . As a result, air from outside rushes in the nasal and oral cavities, traveling down the pharynx, larynx, and trachea into the bronchi to reach the lungs and alveoli. 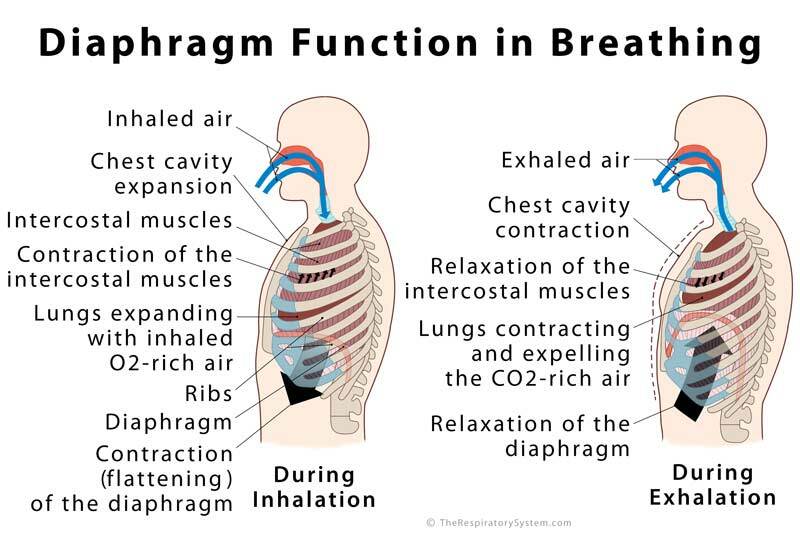 As the diaphragm contracts, it also increases the volume of the thoracic cavity, making room for the inflated lungs . The external intercostal muscles or rib cage muscles (located between the ribs) contract together with the diaphragm, lifting and expanding the rib cage to provide even more space . What Happens to it during exhalation: Once the gas exchange takes place within the alveoli, the CO2-rich air fills the alveoli. The diaphragm then relaxes and comes back to its natural dome shape, reducing the space within the chest cavity, thus putting pressure on the lungs so the air can be pushed out . 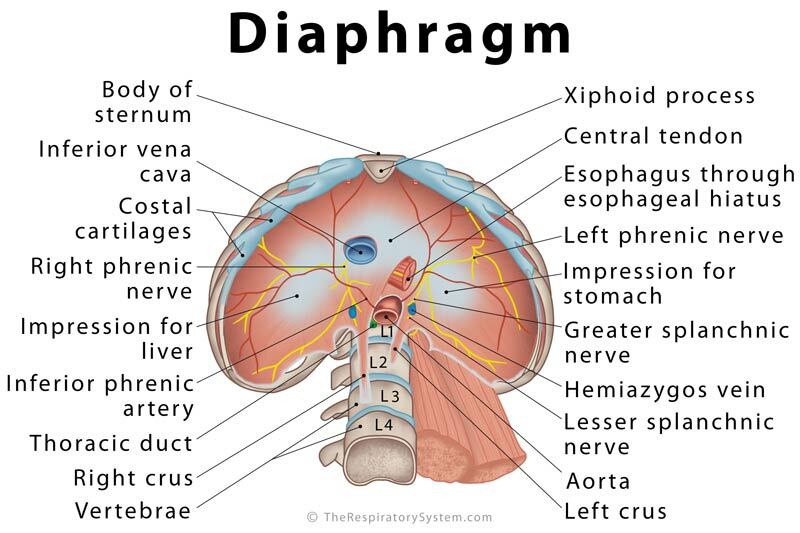 The diaphragm muscle usually moves in a specific rhythm; but sometimes, it gets irritated and contracts too quickly, which makes you draw in excess amounts of air within a short time, which then hits the vocal cords and larynx, causing them to close suddenly, leaving you with a hiccup . A few things that might irritate the muscle include eating too fast, spicy foods or foods that are too hot or too cold, drinking soda or other carbonated drinks, and even stress . It is not directly a part of the digestive system but serves the important purpose of keeping the abdominal cavity, and all the organs of the digestive system separated from the respiratory system, so both can function properly. It also allows the esophagus to run through the esophageal hiatus so it can connect the pharynx to the stomach . Diaphragm Spasms: Sometimes, the diaphragm spasms causing harmless hiccups may last for days or weeks, indicating some underlying health condition. Sometimes, this abnormally contracted muscle may make it difficult to breathe deeply, leading to other problems . Paralyzed Diaphragm: A trauma to the phrenic nerves, lung or lymph node cancer, injury or surgical trauma to the diaphragm, certain spinal cord conditions and neuropathic diseases may weaken or paralyze the diaphragm (one or both sides). Since the two halves can work on their own, one side being collapsed does not hamper the functioning of the other side. However, it still interferes with the lungs’ ability to take in air, as the muscle cannot contract to its full capacity . Elevated Diaphragm: Sometimes, the sheet muscle may elevate a little higher towards the chest cavity due to some abnormality in the tissues and organs around it. Possible causes include blood clotting or infection within the lungs, pulmonary fibrosis, a collapsed lung , and abdominal tumor . Diaphragmatic Hernia: A birth defect, occurring as a fetus is developing in the mother’s womb, it causes the abdominal organs to move up an abnormal hole in the diaphragm . Such cases usually need a diaphragm repair surgery once the baby is born. Tests like ultrasound and x-ray help with the diagnosis. Diaphragmatic Eventration: Another congenital malformation, it causes the diaphragmatic muscles to partially be replaced with some thin membranous fibroelastic tissues . Other Conditions that Might Affect the Diaphragm: Abdominal bloating may put pressure on the diaphragm, preventing it from contracting properly, leading to a feeling of tightness, irritation, pain when breathing in, and shortness of breath . An accidental injury to the abdomen or chest may rupture the sheet muscle, leading to a number of complications.